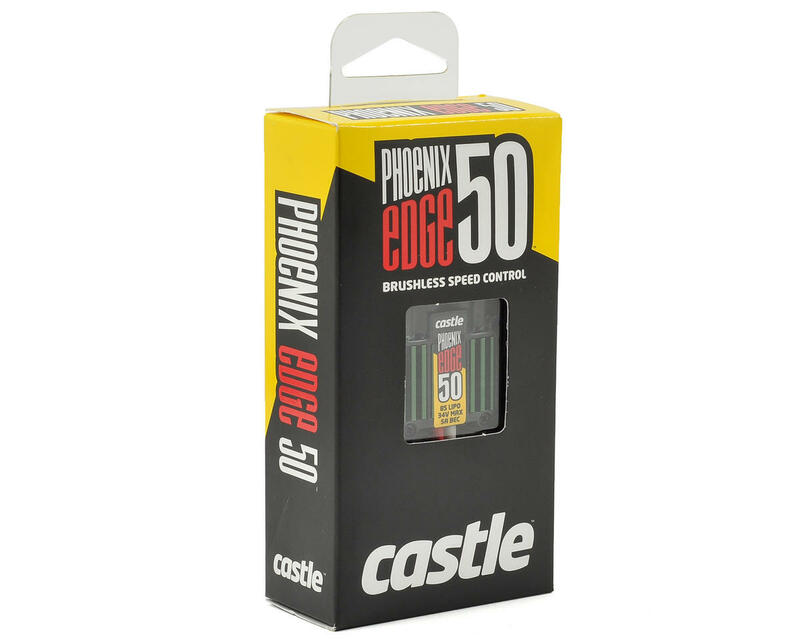 This is the Castle Creations Phoenix Edge 50 32V 50-Amp ESC. The next evolution in speed controller technology has arrived With the debut of the Phoenix Edge series ESC's. The Edge series features a user programmable auxiliary wire capable of functions modelers have only dreamed of, until now. The white auxiliary wire can be used for helicopter governor gain input adjustments mid-flight, serve as an audible beacon after an “unexpected landing”, act as an RPM output for 3-axis gyros that support RPM sensors, be used as an ESC arming lock (coupon for free Arming Lockout Key included) or as a receiver arming lock. Combined with the data logging capability the Edge series of controllers offer, users can enjoy unparalleled versatility. The Phoenix Edge 50 is intended for use in 450 class helicopters and .25 - .35 fixed wing aircraft. As always, the Edge series of controllers offer industry-leading software functions, data logging, and USB programming capability via Castle Link USB adapter (free with included coupon). Fully programmable Castle feature set using Castle Link USB adapter (coupon for free Castle Link USB adapter included in package) and freely downloadable Castle Link Windows software. Castle Field Link Programming Card (sold separately) compatible for select functions. The white auxiliary wire can be used for helicopter governor gain input adjustments mid-flight, serve as an audible beacon after an “unexpected landing”, act as an RPM output for 3-axis gyros that support RPM sensors, be used as an ESC arming lock (coupon for free Arming Lockout Key included) or as a receiver arming lock. 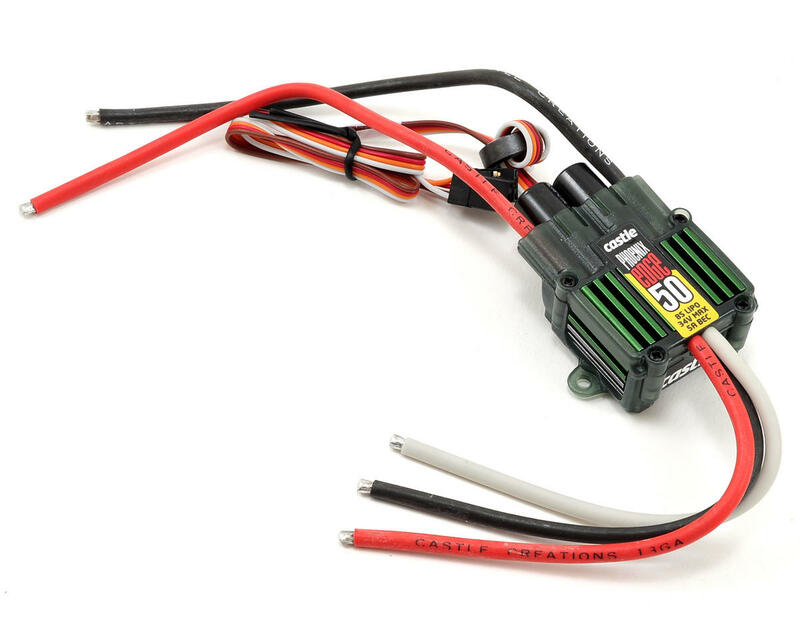 *NOTE: RC HOBBY APPLICATION RATING: 50 amps for the duration of a single 4,000 mAh battery pack with the ESC in contact with a 5 mph airflow of 25°C (77°F) or cooler air. Controller temperature must never exceed 100C (212F). Exceeding current or temperature ratings may damage components and may shorten the life of the ESC. Always verify system current draw at full-throttle. Decrease load or increase airflow to decrease the ESC’s operating temperature. **NOTE: Peak indicates amperage sustainable for 0.5 seconds – long enough for most servos’ current draw transients. Your setup may vary. Always confirm servo current draw before the first flight of the model.